Spring Valley Mn – September 5, 2015: (Photo courtesy of Gulbranson Photo) A warm and muggy day greeted a great crowd at the Annual Baudoin Oil Labor Day Duel. The whole Baudoin family was on hand to honor their mother Margaret Baudoin who was a great supporter of Deer Creek Speedway and the racers and fans. 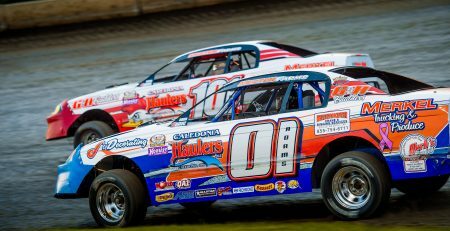 A great field of cars was on hand for the nights racing action featuring the United States Modified Touring Series. First feature on the night was the Dirt Doctor Trucking WISSOTA Midwest Modifieds. 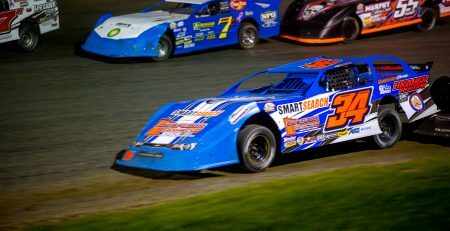 Csaey Trom jumped to the early lead until Garitt Wytaske found the top side to his liking and worked past Trom for the lead on a lap five restart. Robby Franklin worked past Trom on lap ten but Trom kept fighting hard and retook the second spot. Wytaske was checked out up front and cruised home to his first ever feature win with Trom following in second for her best ever finish. Dan Wheeler, Franklin and AJ Roschen rounded out the top five. Jared Boumeester, Wytaske and Jason Born were heat race winnners. The KIK Graphics WISSOTA Street Stocks saw a first time winner on the night as Kyle King jumped out front early on in the feature. Mike Blowers pressured King for the whole race while Danny Hanson worked into the third spot and also made the race up front close. 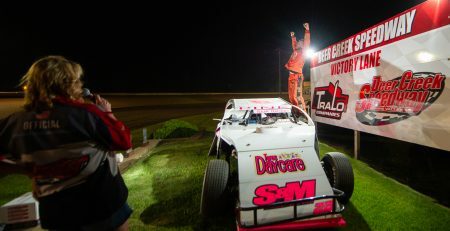 But King fresh off his first ever win the night before came across the line with the win as the checkers flew over the field. 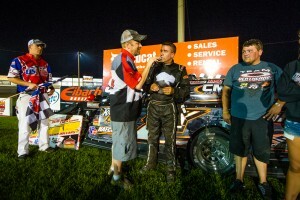 It was Kings first feature win at the speedway. Danny Richards and Blowers took home the earlier heat wins. Behind King at the checkers it was Blowers, Hanson, Danny Richards and Kory Adams rounding out the top five. Neil Eckhart broke an eight year streak tonight as he took home his first feature win since August of 2007 while racing in the Brauer Roofing WISSOTA Super Stock feature tonight. Eckhart took the lead at the drop of the green with Jeff Brauer moving into the second spot on lap three. Tommy Richards moved into the third spot on the next lap but neither was able to make a lot of ground up on Eckhart up front until the closing laps. Richards worked past Brauer on lap twelve and closed in on Eckhart but was unable to make a pass as Eckhart took home the win. Richards, Brauer, Jon Jenson and Kevin Hager rounded out the top five. The heat race was won by Richards. 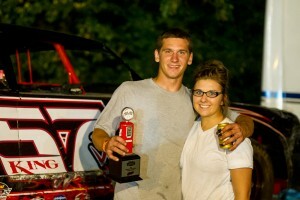 Jon VanMinsel took the lead at the drop of the green during the USRA Iron Man B-Modified Feature event. Cole Denner sat in second while Cole Queensland quickly worked into third. Denner started to pressure VanMinsel up front and on lap five Queensland joined the battle. On lap six they went three wide for the lead with Queensland taking control. Denner took over the second spot while a couple late restarts saw Denner and Jake Timm battling for control of second. Queensland took home the win ahead of Denner, Timm, Jacob Bleess and VanMinsel. Queensland, Kadden Kath, VanMinsel and Dan Hovden took home the heat wins while Ben Moudry and Derek Clement won the B features. The final race of the night was the USMTS Feature event. Jason Hughes drew the pole and jumped out to the early lead. Brandon Davis and Ben Kates battled early for second. With twelve down Derek Ramirez moved past Davis for the second spot while Mike Duvall and Zack VanderBeek battled for the fourth spot. VanderBeek moved into fourth and eventually worked into the third spot. With fifteen down Jason Krohn worked from his tenth starting spot into the top five. Krohn took fourth on lap nineteen and then by lap twenty seven was battling with Ramirez and VanderBeek for the second spot. VenderBeek took over the second spot on lap twenty eight and then Krohn snuck by for the third spot. A caution on lap thirty three changed everything. On the restart VanderBeek took the top groove and left Krohn the bottom where he had made up all of his ground. On lap thirty four Krohn took over the point and slowly pulled away from Hughes who now had VanderBeek all over him. As the white flew VanderBeek made the past for second but Krohn came home with the win over VanderBeek, Hughes, Ramirez and Duvall. Heat races were won by Steve Wetzstein, VanderBeek, Kates, Davis and Ramirez. 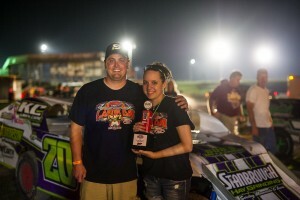 Brad Waits and Brent Larson won the B Features. 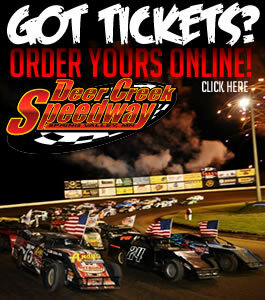 Racing action will resume on September 19th with the World of Outlaw Sprint Cars on the card along with the USRA Stock Cars. Sneak Peek at Event Shirt – LIMITED QUANTITY AVAILABLE!